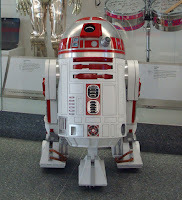 In January 2007, I started building my own droid in my Indiana University dorm room. By August of 2008, I had completed it with the help of Cincinnati builder, Daren Murrer. Finished just in time for the premiere of Star Wars: The Clone Wars theatrical release, we spent the next three years traveling around the country operating our droids at conventions, movie premieres, and other Star Wars-themed events. The first droid turned out quite well - standing up to more abuses and operating more reliably than most others I encountered. Some elements, such as the full-sized Optima Battery and the 80/20 aluminum internal frame that made the droid very rigid. These additions really helped with the reliability, but did cause some issues with my frame (which wasn't really up to the challenge I gave it) or the skins (which never had a back door cut in them). Over time, the rest of the parts were starting to show the abuse I had put them through. 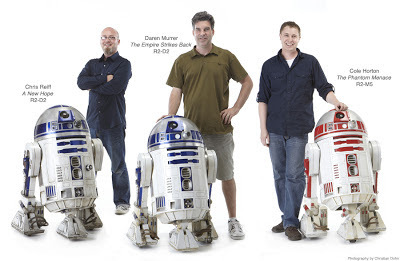 In 2011, Daren, Chris Reiff, and I began looking at ways to make a more rugged, more accurate, and all around re-designed droid to meet our unique needs. Instead of using parts there were designed to do things we don't need (such as 2-3-2 or opening doors), we decided to make many of our own parts that do exactly what we want - and nothing more. After studying reference, we also found some opportunities to make the droids more accurate to the specific versions we were all trying to recreate. For example, I was trying to replicate a red and white droid from Star Wars: Episode I The Phantom Menace. This droid has many interesting characteristics, like an extended center ankle and paint scheme. In order to make this droid, I would have to make some custom parts. Chris and Daren got to work redesigning all the parts and we spent the next nine months creating our new droids. Coined R2.0, the project was a complete rebuild for me; only my feet, a few electronics, and battery boxes were reused. The rest of the parts were either be sourced from R2 Builders Club members or custom machined in aluminum by us. Many of our changes meant that we had to create our own parts. For a complete log of the R2.0 builds, visit our progress page on Astromech.net (login required). 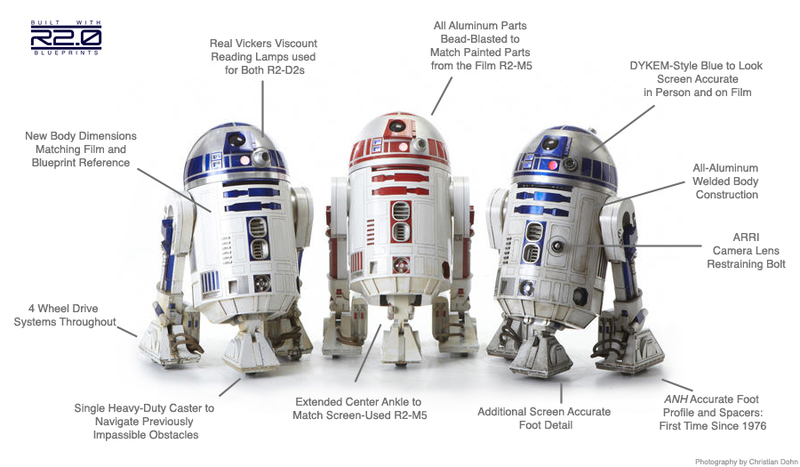 I officially renamed my droid to reflect the latest naming used in licensed products, R2-M5. Here is a comparison of my build and the actual prop used in 1999's, Star Wars: Episode I, The Phantom Menace.